Madison Academy Acros participated in the annual Acrofest that featured the Southern Adventist University Gym-Masters as clinicians on January 29-31 at Highland Academy. Those in grades 5-12 were eligible to participate and learned or enhanced their skills in tossing, pyramids, tumbling, three highs and other gymnastic activities. On Saturday night teams performed their routines with the Gym-Masters giving the final performance of the evening. Parents had the opportunity to speak with the teachers and administrators during the Parent-Teacher Conferences after school on Monday, January 26th. Parents were encouraged to make appointments that best fit into their schedule. Many appreciated that face to face time while interacting about their children. 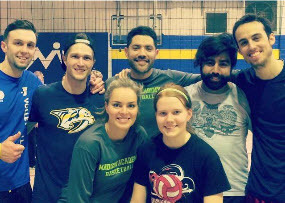 Twenty three teams from across the mid-state participated in the annual late night volleyball tournament. With so many teams this year the squads were randomly placed in the double elimination brackets. The games started around 6:30pm and ended the next morning around 5am. Volleyball teams of all ages — elementary age to those eligible for AARP cards — were submitted to the Student Association sponsors. Each played with a minimum of six players: four guys and two girls. When teams were not playing players took the responsibilities of referee and line judge. For community members that came to watch the teams compete there were concessions available most of the night. Here is a picture of the winning team. Tuesday morning students and staff dressed in their best nerd day clothing and hair styles. At assembly students were divided into their class and competed in the annual Brain bowl. The next day was twin’s day. The assembly activity involved two people from each class: making and eating a peanut butter sandwich; both twins holding a golf club and pushing a golf ball through a maze; and finally a pair of students simultaneously blowing bubbles with the bubble gum given. On Friday, students dressed up in their career of choice. Earlier in the week teacher’s also equipped willing volunteers to lead out in class on Friday. The final games of the class volleyball tournament will be this Wednesday. During the first week of the semester the Juniors, Sophomores and others met with Mrs. Fuentes, Mrs. Hamberger, Mr. Ramkissoon and Mr. Hamberger to discuss the results of the PSAT/NMSQT test given in mid-October. This is a scholarship qualifying test given annually to be considered for the National Merit Scholarship Program. Those students that score in the 99th percentile earn a finalist status and many universities and colleges significantly reduce the cost of tuition to attend their school. Each student was given results and an access code by College Board to further understand the test, the next steps and future options. Class Volleyball matches started on Wednesday, January 7 during assembly and will continue to the end of the month with a break for SA Spirit week activities the week of January 19. Each class plays girls and guys matches: 3 games to 11 points. Activity point as well as spirit points are awarded for showing up and encouraging your classmates in addition to getting everyone involved playing. The Senior and Junior guys are both 2-0 and will play each other on January 28th to determine a winner. On the girls side the Freshmen are 2-0 and will play for a sweep.